Indiana Unversity of Pennsylvania's College of Fine Arts Dean Michael Hood (MA Drama & Communications '75) has been honored by The College of Fellows of the American Theatre as an American Theatre Fellow. He will hold this recognition for a lifetime. He was inducted at the Kennedy Center in Washington, D.C., on April 19, 2015. The College of Fellows of the American Theatre originated in 1965 within the American Theatre Association. Today the College is an autonomous, nonprofit organization of 132 members that holds its annual meeting and investiture of new members each April under the auspices of the Education Department of the John F. Kennedy Center for the Performing Arts in Washington. Investiture in the College of Fellows is one of the highest honors bestowed upon educators and professionals of the theater. Those individuals of recognized national stature who become invested in the College of Fellows represent the highest standards of distinguished service and notable accomplishment in artistic creativity and/ or scholarly research. The membership includes actors, critics, designers, directors, playwrights, producers, program administrators, distinguished teachers and scholars associated with the commercial, not-for-profit and educational wings of the American theater. Hood, who has served as dean at IUP since 1998, has a professional career that blends theater education, academic administration, leadership in national and international organizations, publications in scholarly journals, and performance work as an actor, director, and fight choreographer. Hood began his administrative career as chairman of the Department of Theatre and Dance at the University of Alaska, Anchorage. His publications and conference presentations represent a variety of subjects from the Canadian scenographer Robert LePage to stage combat in Shakespeare’s “Henry” plays. Hood is an associate member of the Society of Stage Directors and Choreographers and is a member and certified teacher of stage combat in the Society of American Fight Directors. He also has served on the board of directors of the International Council of Fine Arts Deans and is a member and is currently vice president of the National Theatre Conference. He serves as a mentor in the Association for Theatre in Higher Education Leadership Institute and has made a number of invited presentations on leadership for the National Association of Schools of Theatre. 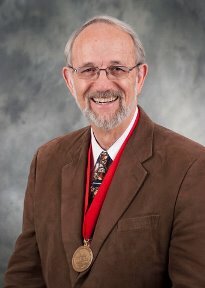 At IUP, he has helped to realize the renovation of Fisher Auditorium and the creation of the Performing Arts Center, the renovation of Cogswell Hall and the renovation of Sprowls Hall Basement, as well as the renovation of space for ceramics and sculpture in Robertshaw as part of the establishment of the IUP Center for Wood. He was instrumental in the establishment of ArtsPath, the college’s arts-in-education partnership with the Pennsylvania Council on the Arts, as well as in the creation of the IUP Community Music School. Hood has a bachelor’s degree in theater from Arizona State University, a Master of Arts degree from the University of New Orleans in drama and communications, and an MFA in acting and directing from the University of New Orleans. He is a member of Indiana Rotary Club. He and his wife, Dr. Katherine Hood, are the parents of two adult children.